Properties: High strength, low stretch, good resistance to abrasion and UV light. Lustrous appearance. Uses: Picture cord, flag halyards, bricklayers lines, blind cord, curtain cords, etc. Only available in natural (white) and black. Braids are generally produced in one of two constructions described as 1/1 (one-over-one) or 2/2. 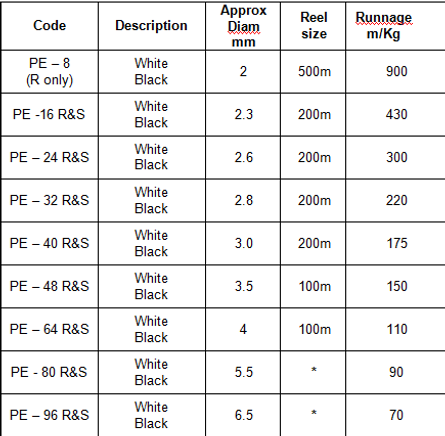 In our lists 1/1 is indicated by a prefix 8 (R), eg PE 8/48, and 2/2 by prefix 16 (S) eg PE 16/96. The braid's 'tube' or 'hole' can be wholly or partially filled with yarns or other materials producing a core braid or even a smaller diameter braid (to produce 'braid-on-braid'). This may be useful to stop the braid from flattening or to confer some additional property, such as greater strength or extra stiffness. In other cases, the use of a cheap core material allows a larger diameter braid to be produced at lower cost.